Pretty red roses, vivacious orange Gerberasand splendid purple Irises are united to createthis beautiful bouquet of marmalade, to bringmagic, warm feeling of love and romance toa special heart.Vase is not included however; If you wish tomake a fantastic impression, may we suggestthat you add the Premium Box of Chocolatesand let your special someone take pleasureof enriching all the senses, sight, touch, smelland taste. 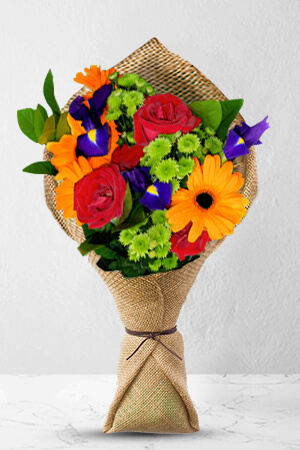 Flowers were delivered to the right place on time and were beautiful. Made my Mum's day! there was a very helpful person on-line called Brian who made it all very easy. My only comment would be that I got a confirmation on 1 March when the delivery was for 29 Feb. I did find out it was delivered on 29 Feb thankfully but if there is a possibility it cannot be delivered on a requested date, customers should be told that before final purchase. Great service. Very informative ?? I didn't see them and don't know what condition they were in. Just know they were left on my daughters front door so hope they wernt there too long. I did request she be called if she wasn't there to collect them.